A beautiful, peaceful place with a great view! The first time I saw this I couldn't believe it - if you've never seen it, it'll take your breath away! I enjoy reading the names, but my favorite part of it is the view. Being married to The Boatman, this place just emphasizes the way of life we've survived for all the years we've been married. You're looking for a magnetic keyholder. It has only a log (no more room! ); BYOP. While you're there, sit down at a picnic table and enjoy the view - that is, if the wind isn't too rough! When you leave, take the driveway to the right to avoid the blind hill, and be sure to stop at the end of the drive and read the historical markers. 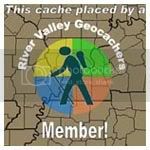 I hope to put a few more caches out around this area - there are none except mine until you cross over into Illinois. Enjoy!